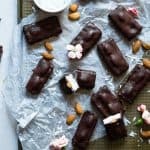 These homemade paleo almond joy bars are a healthy, low carb remake of the classic candy bar that you will never believe are sugar, dairy, grain and gluten free! Partially because, beyond the paleo witch finger cookies, homemade twix bars, and spooky mini banana cupcakes, I could NOT think of anything else “cutesy and festive for Halloween” that didn’t require ALL the not-so-good for-you ingredients. But mostly because I am OBSESSED with the magical combination that makes up Almond Joy: creamy coconut and rich, deep, dark CHOCOLATE. You knew this already from the crispy no bake almond joy bars, salted “Almond Joy” no bake bars and coconut almond skillet paleo brownies. You loved those JUST AS MUCH as I did, so I figure you’re not the LEAST bit mad at me for yet another coconutty-chocolatey-wanna-eat-them-all-at-once kind treat. 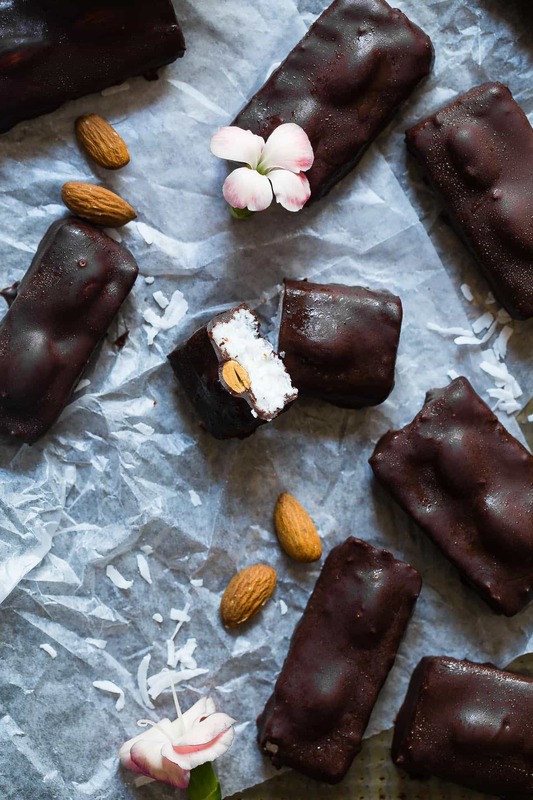 Especially one that is easier than almond joy coconut ice cream bars. AND when they are only 5 INGREDIENTS (!!!) LOW CARB and SUGAR FREE. <– Um. WUT. 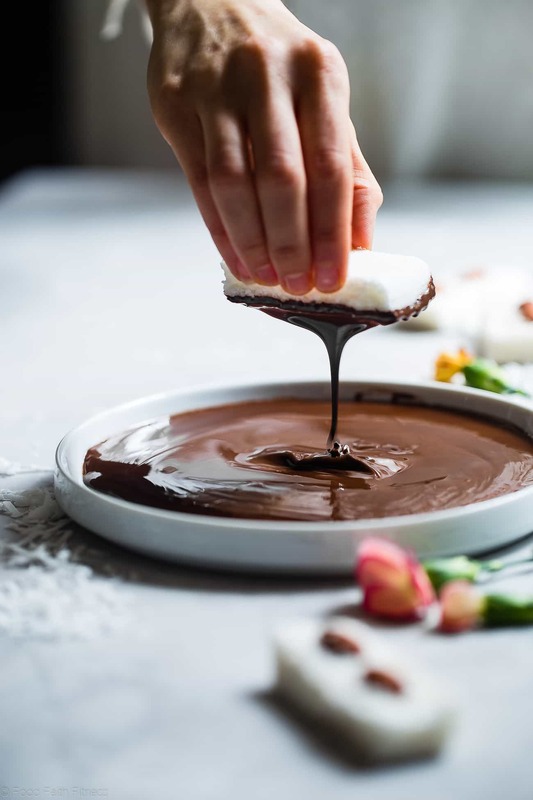 Feel like my hands are permanently covered in melty chocolate from a little coconut dip-dip-dip action, and VRY VRY okay with that. Toast your almonds. Mr. FFF and I think that this is VRY VRY necessary and key for maximal flavor. But, more on that later. Blend unsweetened coconut flakes with monkfruit in a food processor until the coconut flakes break down. I LOVE using monkfruit here because it acts exactly like sugar. You don’t want to sub in something like honey, as it does have a different texture and changes things – I tried it. Stream in some water and melted coconut oil. This helps the coconut stick together while blending. But, when it freezes and both become solid, that is when it has the REAL staying power! 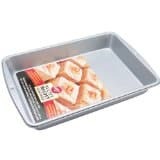 Press into a parchment paper lined pan. DO NOT omit the parchment, and make sure you leave enough to use as a handle to life the bars out once frozen. A-L-S-O, cut the bars BEFORE you freeze them. After does NOT WORK. Listen to me on that one. Break them apart, dip them in melted chocolate BLISS and YUM. 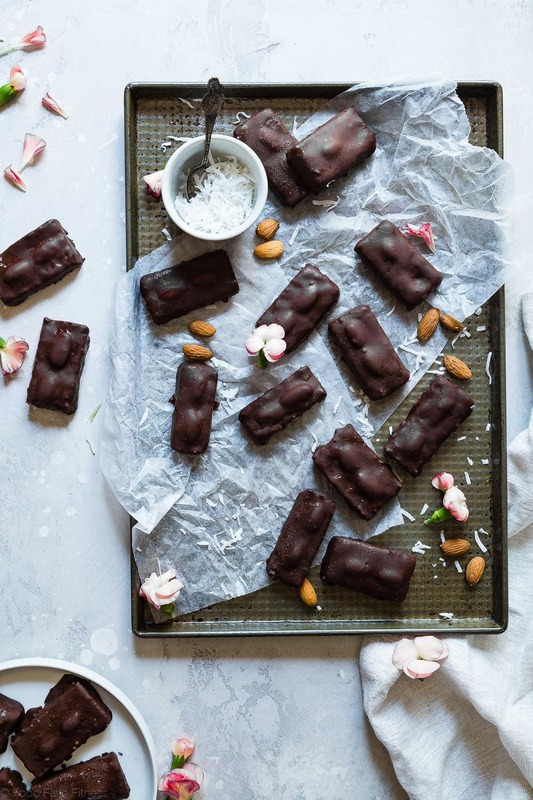 If you’re one of those people who are always secretly craving chocolate, but know that you should also really give something like spinach more of a chance because GLOWY-SKIN-HEALTHY-FOOD, then these bars are 4 U. Which is pretty much all of us. 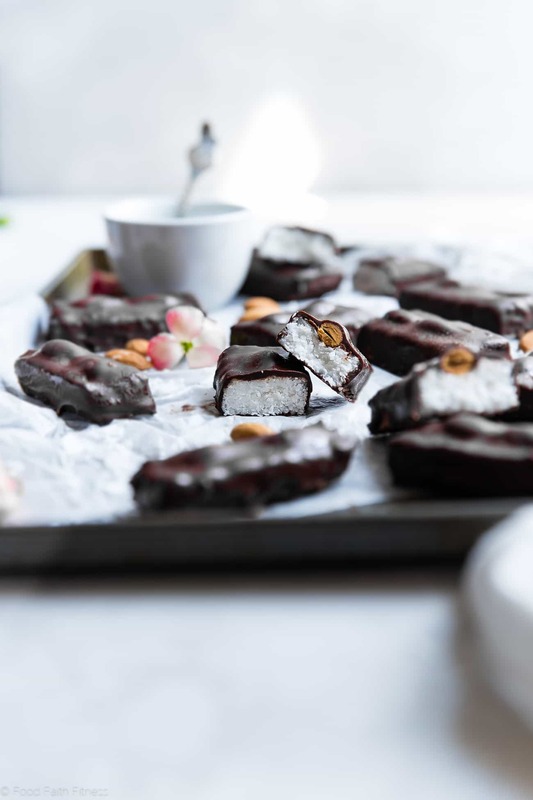 These dark chocolate almond joy are loaded with heart-healthy fats and almonds, like aforementioned spinach, are a SUPAH FOOD. In my mind that pretty much means that 1 almond joy = the same as a HYOOGE bowl of leafy greens. I don’t really know if it works like that, but I think you and I are both okay just GOING with it. I do need to be open, honest and REAL with you though: these homemade almond joy DO lack that really fake-made-of-questionable-ingredients-how-does-it-even-get-that-texture inside stickiness that the store-bought kind does. If you’re mad about that fact, then these are NOT 4 U. But, if you can look past a little lack-of-creepy-questionable-high-fructose-corn-sryup-sticky-quality, because taste is more important, then I foresee the current make-almond-joy-all-the-time-to-keep-supply-and-demand situation of life that I am in, A-L-S-O happening in your life. Straight up. Tastes THE same. As promised, deep thoughts on toasting almonds comin’ at you: I HIGHLY recommend that you toast your almonds first, because it gives SUCH a rich and complex “adult” flavor to the candy bar from your childhood dreams. I also HAVE to toast any nuts EVER that I use, or Mr. FFF gets angry. For real. When there is a recipe with nuts, he asks me “ARE THEY TOASTED? !” before he will even munch on it. Ugh. I also understand the lack of motivation to turn on the oven and spend a WHOLE 10 MINUTES toasting said nuts though, that would just be a HUGE travesty if you had to spend 10 whole minutes of your life doing something that would result in roasty, toasty flavor PERFECTION. That was supposed to be sarcastic, internet friends. TOAST THEM ALMONDS. Pro tip: don’t make these vegan almond joy to give out to kids on Halloween. We all know that parents will make their kids throw out any homemade goodies for fear of FOUL PLAY. This gives you FULL permission to eat every. Single. One. Yourself. Look at you, taking one for the time in the name of NOT WASTING FOOD. SUBSCRIBE TO MY YOUTUBE CHANNEL AND NEVER MISS A RECIPE! New recipes posted each week! Total time does not include one hour freezing. OPTIONAL: Heat your oven to 375 degrees and place the almonds on a baking sheet. Cook until browned and "nutty" smelling, about 10 minutes. ** Set aside. Line an 8x8 inch pan with parchment paper, leaving some to hang over the sides to use as a handle. 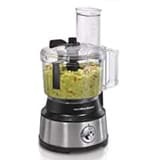 Place the coconut flakes and monkfruit in a large food processor and pulse until the coconut flakes begin to break down, scraping the sides as necessary. Add in the remaining 4 tsp of water and pulse until the mixture turns crumbly. Pour into the prepared pan and press out evenly and VERY FIRMLY. You want to make sure the bars stick together. Use a very sharp knife to slice into 18 bars (6 rows of 3 bars) as it's hard to cut these after freezing. Place two almonds firmly in the center of each bar. Make sure to REALLY press them in firm, or they will fall out when you dip them. I like to really press my coconut after cutting, and then re-cut any areas that need it, to make sure it's really pressed in firmly. Chill in the freezer for 1 hour until firm. 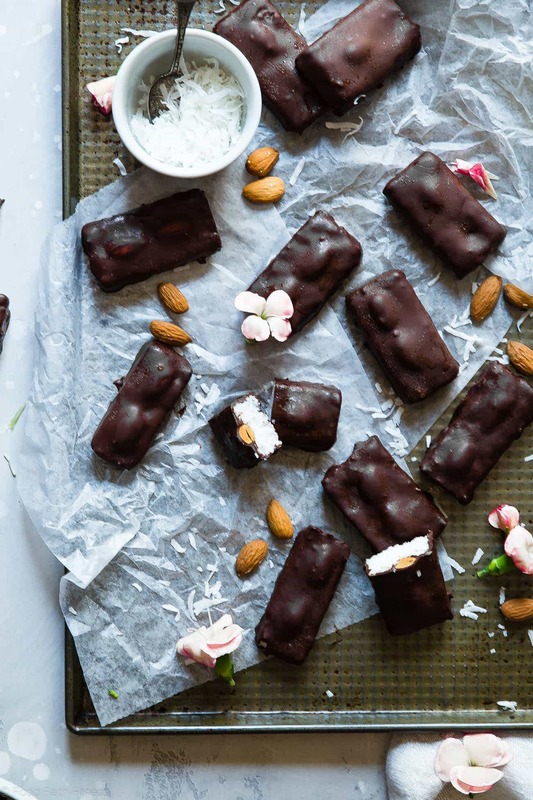 Quickly dunk each bar into the chocolate, gently shaking all the excess chocolate off, and then place onto a parchment paper lined baking sheet. NOTE: if your almonds fall off, dunk them in a bit of chocolate and use it as a glue to stick it back on the bar before dunking it in chocolate! Store in the refrigerator and DEVOUR! 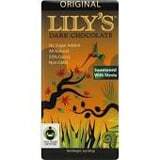 *You only need 6 oz to cover the bars, which is reflected in the nutritional information. However, if you want to make it a little easier on yourself, melt 8 oz. Having a little excess makes the bars easier to cover! ** You don't HAVE to roast your almonds first, but I think it adds some great flavor so I recommend it! ***I like to put my container on top of a kitchen towel that I have placed on top of a pancake griddle that I have heated to the lowest setting. This keeps the chocolate smooth and warm! These look absolutely fabulous! I love how they’re shaped like the original, but SO much more nutritious and, I”m certain, delicious too! I tried to make them look the same as possible!! Thanks Marissa! Almond Joy Bars were always a huge hit in my house. I’ve never tried homemade before but your recipe looks delicious! You gotta try Katie! So tasty and actually really easy! Seriously, these look bomb! I loooove almond joy, so these are straight up my street! Love! Then you have to try these girl! Thanks! YUM!! I love almond joys but I like the dark chocolate on mounds better. Can you use coconut shreds instead of flakes? If so – same amount? How many grams? I really can’t tell you as recipes are only tested as is – I am sorry! My best guess would be to use the exact same weight – whatever that is in cups. But, I just can’t promise it’ll work. let me know if you try it! do you know how many grams of coconut flakes you used? Yep – it says in the recipe 🙂 240! Can’t wait to make these! 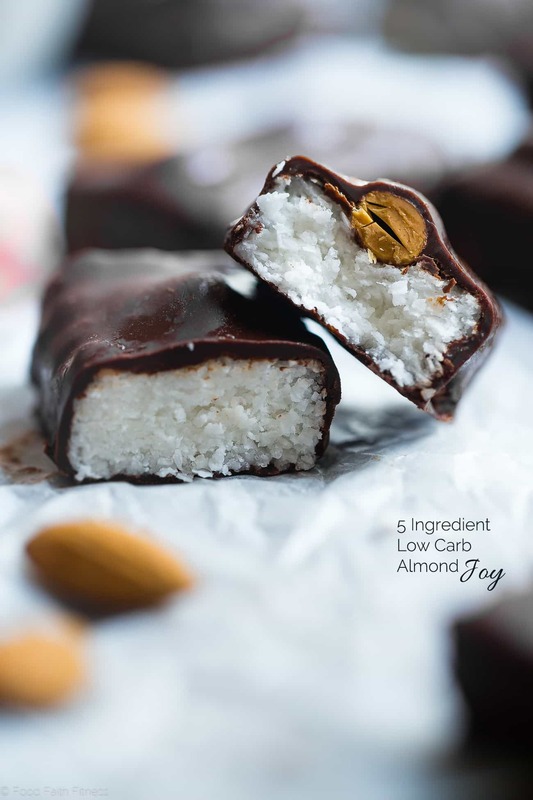 I love the combination of chocolate and coconut!! You and me both! I hope you love them! I feel like that’s a good life plan! 😉 Thanks! 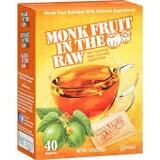 What would be a substitute for monkfruit? I tried making these in ball form and cannot get them to hold together very well, I am only using water can coconut oil. I think it’s because you’re trying balls to be honest – these really need to be TIGHTLY packed together in bars, in order for them to stick! You could try honey, since it’s sticky? But recipes are only tested as written so I can’t tell you how much/if it’ll work! Sorry! Let me know what you try! These were so easy to make and tasted amazing! YAY! So happy to hear that! Thanks for letting me know! What is your serving siZe for the macros posted? 1 bar?